What is the steep turn. How to practice steep turn. To make a canyon turn. To make a steep descend cloud. What is the rule of thumb for starting your roll out from a turn? As we roll into, or recover from a turn, rudder control is used. What is the reason for this ? You are in a climbing turn to the right, using 30° angle of bank and have been directed to rollout on a heading of 095°. On what heading should you begin to rollout ? What happens to stall speed and load factor as speed increases? The greater angle of bank, the greater the amount of lift required to maintain a constant altitude. Increased lift produce increased drag, thus more engine power is required to maintain a constant airspeed. Therefore, the angle of attack that can be sustained in a level turn (disregarding structural limitations) depends on the engine power available. When the airplane is in banked attitude, lift acts inward toward the center of the turn, as well as upward. 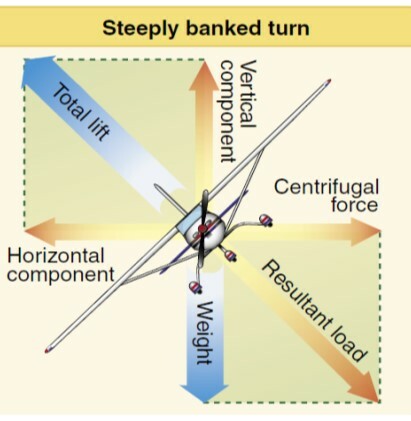 Since the vertical component of lift decreases as the bank angle increases, the angle of attack must be progressively increased to produce sufficient vertical lift to support the airplane’s weight. The fact that the vertical component of lift must be equal to the weight to maintain altitude is an important thing to remember when making constant altitude turns. As the radius of a turn becomes smaller a significant difference develops between the speed of the inside wing, and the outside wing. The wing on the outside of the turn must travel a farther distance in the same amount of time as the inner wing. Thus the outer wing travels faster and creates slightly more lift than the inner wing, and the plane wants to continue rolling into the turn after the controls are neutralized. To correct overbanking, use a small amount of opposite aileron to maintain your desired angle of bank. 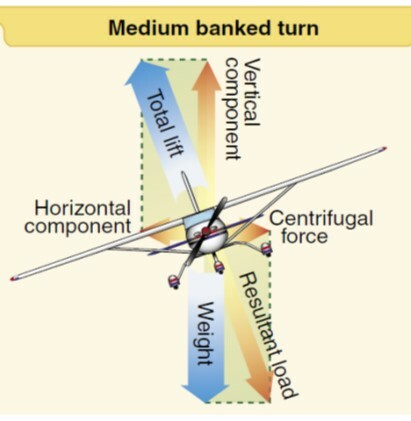 In a steep turn, load factor is 1G + the amount of centrifugal force acting on the aircraft. To counteract adverse yaw, correct rudder pressure must be applied when initiating a turn. Turns to the right display more adverse yaw than turns to the left because of the natural left turning tendencies our airplane exhibits, the adverse yaw is counteracted a bit more. A steep turn is entered like any other turn, but as the angle of bank is increased beyond the 30 degrees angle you will need extra engine power to maintain altitude. 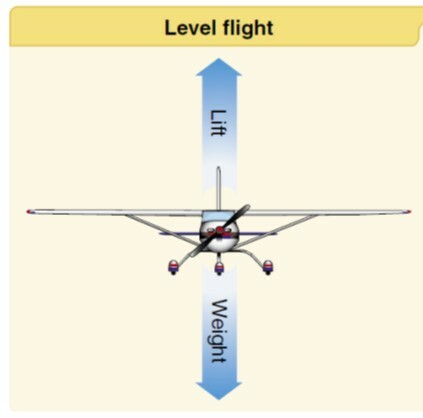 Be sure that the aircraft is in straight-and-level flight. Look around for other aircraft. Roll the aircraft gently to the desired bank attitude with coordinated aileron and rudder. when you pass through 30 degrees Angle of bank add back pressure and increase power to maintain altitude. At the same time, use appropriate rudder pressure to control any tendency for the aircraft to yaw adversely. Use elevator to maintain the aircraft in the correct pitch attitude in relation to the horizon. Start to roll the wings level prior to the specified landmark with aileron control, below 30 degrees of bank reduce power to avoid climbing. At the same time, use appropriate rudder pressure to control adverse yaw. Maintain correct pitch attitude with elevator control. you start rolling wing level at your half of bank angle. ex: 45 degrees turn, you want to go to 360 degrees heading, you stop your roll at (45:2= 23, 360-23=337) 337 degrees. Turn 90 degree to the right/left then come back to your initial heading. Or turn 180 degrees and stay a this heading. WATCH YOU AIRSPEED !!! Stall Speed increases with increased bank angle. Load Factor limitations: check your POH. Attitude Indicator for bank angle. Vertical Speed Indicator for rate of climb/descent. A steep descending turn can be used to come down through a hole in cloud. Care should be taken in a steep descending turn to maintain safe and constant airspeed and avoid a spiral. be sure to look outside to ensure that the center of the nose does not drop during the turn. What’s the link between angle of bank and lift? Why you need more back pressure as the angle of bank is increased in a turn? Why and when you have to increase power during a steep turn ? What happens to load factor and stall speed as speed increases ? How do we do a look out before we start a steep turn ?